A new attraction called Gulliver's Gate is opening just off Times Square. That is in New York City. The attraction shows 100 world landmarks in miniature. The indoor display covers 49,000 square feet. It includes scale models of structures, cities and landscapes. These include the Brooklyn Bridge and the Eiffel Tower. It has the pyramids of Egypt and China's Forbidden City. In addition, it includes the Taj Mahal, Mecca and Niagara Falls. It also has Rio de Janeiro's Christ the Redeemer statue on a hill overlooking the beach. Many of the structures are very detailed. One is of Grand Central. It includes the famous New York train terminal's cathedral windows. It also has the iconic clock. You can see the zodiac symbols outlined on its green ceiling. Another section of the display shows a New England scene. In it, trees are ablaze with fall colors. They are next to a snowy mountain. The attraction is named for the 18th-century novel "Gulliver's Travels." The story is about a man shipwrecked on an island. It is inhabited by tiny people. Gulliver's Gate scenes are filled with little toy-like people and vehicles. The attraction has one other thing in common with "Gulliver's Travels." The book was a satire. Gulliver's Gate offers a few funny winks at real-world scenarios and pop culture. There is a traffic jam in St. Petersburg, Russia. And there is a Manhattan scene of mayhem. You'll also find graffiti in several different languages. And, you can see the Beatles crossing Abbey Road. Gulliver's Gate has a amazingly old-school feel. 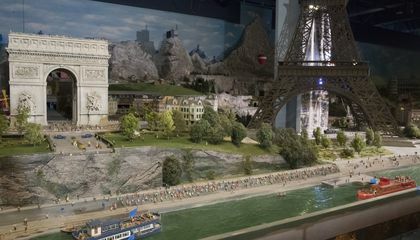 It is more like a traditional museum diorama or model train exhibition. There are just a couple of small video screen parts along with a few moving parts in each area. These include balloons, boats and scenes of a concert in England. The concert will switch between Adele and the Beatles. Gulliver's Gate chief marketing officer Jason Hackett described the experience. He said is uniquely "forward-looking and nostalgic." It should appeal to visitors of many ages. Hackett says the exhibit will be tweaked periodically. He wants to keep it up to date. There was one last-minute addition. It is a tiny model of the "Fearless Girl" statue. It recently appeared in Manhattan's financial district. It sits across from the famous charging bull sculpture. Visitors will be able to access an app on their phones. It will help identify what they're looking at. General admission is $36. It is $27 for seniors and kids ages 3 to 12. There are also a couple of pricey add-ons. For $44, you can step inside a scanner. It creates a 3-D model of you. 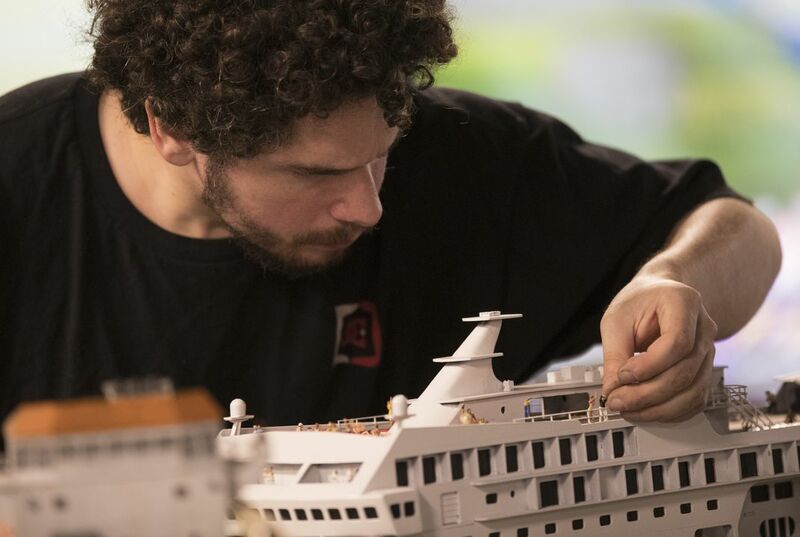 The model takes three weeks to complete. But you can have it placed in the display alongside the other little people. For $145, you can get the scan. Then you can have your tiny model placed in the display. An action figure-sized model can be mailed to you. Gulliver's Gate is located on West 44th Street. It is near several Broadway theaters. It is near Carmine's. That is an Italian restaurant popular with tourists. It's one of several new sites opening in the Times Square area this year. Opry City Stage is an entertainment complex devoted to country music and Southern culture. It opens this summer. The NFL Experience Times Square will showcase pro football. It opens in November. And National Geographic ENCOUNTER: Ocean Odyssey launches this fall. Gulliver's Gate co-founder Eiran Gazit is behind a similar attraction in Israel. It shows that country's landmarks. Why will the attraction be kept “up to date?" That is really cool! i would love to go there and I'm sure there will be lines out the door tho get in. it is a good idea because people can see landmarks but not have to take much time off work or have to pay the huge amount of money.